We strongly believe in the ethical manufacturing of goods, and are also proud to offer merchandise from Canadian businesses whenever we can. B.Young brings the FUN & energy to Scandinavian designs! With B.young you have the perfect opportunity to express your own personality through new and fresh styles all year around. Featuring quirky prints, bold colours, & easy basics, there's always a little something to make both you & your wallet happy! C’est Moi is a Canadian company based in Toronto, Ontario. They have perfected fashion basics to cater to the young contemporary ladies market. Since 1989, the C’est Moi Clothing line has always offered both trendy and classic pieces that suit any woman’s lifestyle. Their widely popular seamless collection is available in a variety of colours, fabrics and styles. The collection offers a sleek look in seamless leggings, camisoles, slips, bandeaus and long-sleeves tees for everyday wear. This line is designed and manufactured with care in Canada! The collection was originally created as travel wear - comfortable, easy & wrinkle free! With the mission to give women the freedom to live their lives without compromising on comfort, convenience and style, it wasn’t long before women were wearing their designs day and night – not just for travel. Code Vitesse's unified collection has the ability to transition smoothly from daytime, to afternoon, to evening – all the while, keeping women looking fabulous! Try these fabulous pieces in-store today! This Scandinavian brand is built with extra length & oozes bohemian vibes with a cool but professional edge! For over a decade, CREAM has been celebrating femininity by offering a unique, trendy signature look. It speaks directly to the heart of women who adore bohemian luxury with a Scandinavian feel. This collection is creative, brave and feminine with handmade print designs that deliver a personal touch. This Scandinavian line has funky vibe mixed with raw femininity & is made with extra length! This brand is perfect for the sophisticated woman looking for unique designs with a trendy edge! Since 1957, this luxury, Canadian-made designer has made waves in the global fashion industry. Creating beautifully tailored, unique garments that serve and elevate the wardrobes of real, on-the-go Canadian women, just like you! The company and collections have been constantly evolving to meet the multidimensional needs of today's women. Joseph Ribkoff stands out as one of the leading designers in Canadian fashion industry for nearly 60 years and over 64 international markets.Designed with real women in mind, Joseph Ribkoff is a fan favourite for women of every height, every age & every lifestyle! Since 1993, Kaffe clothing has provided the natural feminine woman with a modern Scandinavian style. Staying true to past styles, and future classics, Kaffe provides an effortless, refined look for the everyday woman. For over a decade Lisette Limoges has been designing women's pants with a purpose: crafting that perfect fit for all women and all body types. Suiting women of every age, height & lifestyle, this brand compasses flattering styles, comfortable fabrics & quality that lasts! This brand is endorsed by both Kathie Lee Gifford and Oprah Winfrey! And best of all, Lisette L garments are made in Canada! Founded in Istanbul in 1991, Mavi Jeans designs a full collection of denim-wear for women. Mavi's philosophy is to create perfect fitting jeans that convey a Mediterranean feeling in terms of fashion and detail. Mediterranean is exotic and inspirational, contemporary and accessible. Mavi, which means blue in Turkish, is known for high quality, great fitting and fashion-forward premium denim. Mavi's brand strategy is 'perfect fit': Mavi fits my world – my lifestyle, my body, and my wallet...and with inseams up to 36" at Hye Fashion, Mavi fits your long legs too! Formerly known as 'Not Your Daughter's Jeans', NYDJ combines style & comfort for every woman. Their exclusive Lift Tuck® Technology flattens you in the front while lifting and shaping in the back to create your most flattering fit! Available in sizes 4 - 18 with up to a 38" inseam at Hye Fashion. Come slip these on & find out why we're obsessed. Nygard International, headquartered in Winnipeg, is a leading fashion company that designs and markets women’s fashion apparel. Known best for their Nygard Slims pull-on pant which lift, shape & sculpt your figure, the line also offers a variety of fashionable pieces including tops, jackets & dresses! Orb has always been inspired by travel and the many ways that it can teach and enrich us. The new perspective travel brings comes from an opportunity to be adventurous and walk a different path to the rest of the crowd. Orb produces high quality, technical outerwear and unique, easy to wear lifestyle clothing, creating packable pieces that really function but in a fabulously fashionable way! Orb clothing is designed in Vancouver, BC with added length in the sleeves and torso so it's perfect for those of us needing extra coverage. As the Denim industry's only female founder, PAIGE denim is truly built by & for women. From the beginning, their founder & creative director Paige Adams-Geller embraced every moment, aiming to inspire and empower as her story evolved. Her journey began in Los Angeles, where her entrepreneurial spirit took her from working as one of the top fit models in the industry to launching her namesake collection in 2004. Every style created is wear-tested, and tested again. They design pieces you'll live in-jeans that go from morning to moonlight & help you stand tall in what you're wearing, and take you exactly where you want to go. The first in vegan streetwear! Ragwear is known for it’s Ragwear guarantee: “NO Child Labour, NO Leather, NO Wool, NO Silk, NO Fur, NO Fur, NO Badness”. This german-designed line creates high-quality, uniquely designed hoodies & outerwear with extra length! Their laidback style is cool & casual while adding fun colours & prints that display your personality! These cozy pieces are tall girl must have for layering under your winter jacket or curling up fireside on long summer nights! Designed & Manufactured in Montreal, Raffinalla creates luxurious suits and outerwear for women. Now producing tall pants specifically for Hye Fashion, Raffinalla has quickly become a Hye Fashion favourite! These Perfect Fit Pants streamline your waistline and compliment your shape by slimming the lower abdomen, contouring the hips and shaping the behind, without the feeling of being bound in tight. With a 37" inseam & many different styles available, you'll easily find your favourite new pant that fits & flatters! Sock It to Me’s motto is to be nice & work hard. Founded in 2004, this Portland designed sock brand is bringing fun & little bit of magic to every sock draw! With ultra stretchy cotton blends, they fit every size & are SO comfortable to wear!! The stretch-it line, even has extra stretch through the calf to accommodate athletic calves! Add a little magic to your sock draw today! Soyaconcept is a Scandinavian fashion design company that creates clothing in tune with the times. Innovation, identity, personality, quality and simplicity are integral parts of their unique designs. Without sacrificing quality, Soyaconcept helps customers build a fashionable wardrobe from their own ideas without spending a fortune in the process. Style as authentic as the women who wear it. Authenticity is essential to positive self image. All women deserve to feel confident in their own skin and Sympli is designed to reflect the diversity of personality and the female figure. Sympli women love who they are and want clothes that suit their character. It is at their core to design clothes that empower women to be themselves; regardless of age, shape, or size. Sympli is proudly & ethically made in Canada. Handmade in Canada by Jenny Campbell, this adorable necklaces are simple yet unique & go with EVERYTHING! 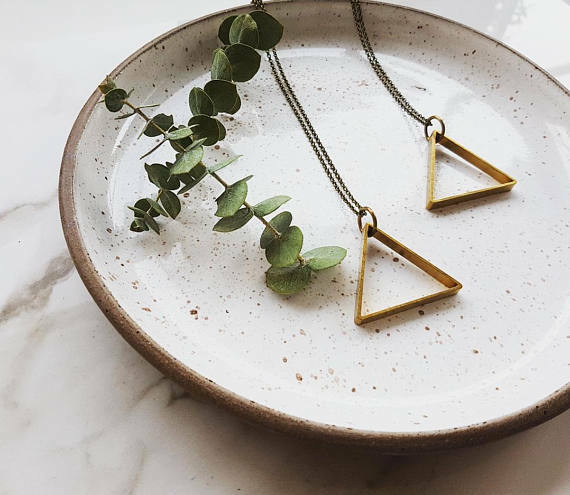 Not only are the geometric designs fresh & modern, they are also made with extra length just for Hye Fashion, so your necklace will always hit in just the right spot! Formerly known as Flatter:Me Belts. The invisible belt that's responsibly made, and made to last. Women with hips probably have encountered the problem when their jeans fit at the bum but have a big gap at the waist, driving you completely bonkers – and adding a normal belt (with that huge buckle bump) is even less flattering. Unbelts keep jeans snug without any bulk under t-shirts - 'cause no one wants extra bumps. They are based in Edmonton, Canada and Shanghai, China - where every Unbelts are measured, cut and sewn in their studio by fairly-paid tailors.